Before ABC’s hit show, Once Upon a Time, the whole idea of classic Disney coming to life in a live-action medium was a completely new concept. That’s why Amy Adam’s Enchanted was such a success, because they gave a new perception on the whole thing. They even planned to make a sequel to the movie. I’m only guessing we haven’t seen it because of Once Upon a Time. There’s really no need anymore when you have a TV show that enlists actual characters from actual stories that you have loved for years. Enchanted is an original story with original characters, but is that enough? The story revolves around Giselle, a Disney princess living in a cartoon fairytale land, complete with singing and dancing and never-ending glee. When she is set to marry Prince Edward, his evil step-mother makes sure the wedding never takes place by sending her to a place where there are no happily ever afters: New York City. In the Big Apple, she meets divorce attorney, Robert Philip, who like most of the world, has lost faith in love, so Giselle brings the magic of her own world and changes things up significantly. So, to get this review started, I want to first say why this worked so well in 2007. First of all, we haven’t ever seen anything like it before. Not really. Bringing a Disney character into the real world just made a lot of sense. Giselle did a fantastic job at reviving hope through the magic of true love. The movie feels very magical, but not in an overbearing way, in sort of a…charming way, if you will. In 2007, it was hilarious and welcome – and it worked for all audiences young and old. But the effectiveness of the movie has washed a little thin since Once Upon a Time premiered. Once Upon a Time, of course, is a live-action ABC show where actual characters from classic Disney films star. People like Snow White, Prince Charming, Aurora, Red Riding Hood, The Evil Queen, and well…practically all the big names throughout the years. It’s absolutely amazing, and yes, it holds that magical feeling intact…just in a different way. 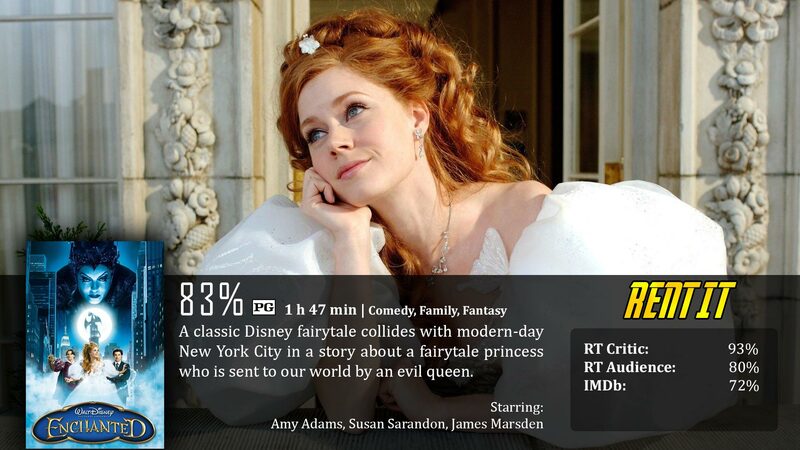 While Enchanted is basically a live-action cartoon with all of the physical humor and singing, Once Upon a Time is more realistic with drama and relationships. So, Enchanted still has significance, but I think in the long run, people want to see actual characters from Disney’s past more. I mean, Enchanted may be an original story, but it’s just a mixture of Sleeping Beauty, Cinderella, and Snow White, to be perfectly honest. I still think kids will love this thing to death because it has a ton of elements that are both fun and good for them in the long run. Adults may also really enjoy it, and that’s fine. I enjoy it as well, I just think that over the years the effectiveness of it has washed out a bit. This is like classic Disney on steroids. In 2007, this was the first time in a long time we got to be reminded how cool and simple the classic movies were – and we welcomed it with open arms. It was also the first time we got a glimpse of a classic Disney cartoon character as a live-action human being, and it was awesome. Great songs as well. Most of what made this movie legendary was back in 2007. It’s still a really fun movie, but now that we have Once Upon a Time, we have live-action classic Disney characters that we actually have loved for decades. Suddenly, Giselle seems like a generic character and I’d rather see the likes of Snow White and Prince Charming in the TV show instead. The acting voices of Ariel, Belle, Pocahontas, and even future Elsa all had cameos in this film. I actually enjoyed this movie because Giselle was so over the top, which made her being out of place in the real world so effective. James Marsden cracked me up too. 😀 All I can say is, its very Disney. I enjoyed it for much the same reason as angie. I was very pleasantly surprised by this movie.